Reaching Kanyakumari is very much easy as it is well connected to the other India cities by rail and road. Even if, there is no airport in Kanyakumari, the presence of airports in the nearby cities makes it much easier for the international travelers to reach Kanyakumari. Once you land in Kanyakumari, you can just check into any of the best budget or luxury hotels available in the city, before starting your travel. Kanyakumari is one such travel destinations in South India, which offers multiple things for a travelers and hence it becomes really confusing on prioritizing your travel activities. Even if you have a travel guide you will really get confused over which places to visit first. The best thing to avoid this confusion is to plan well ahead of your tour and you can do various researches on the internet to list out the major travel places to visit in Kanyakumari. Once you get a list you can prioritize them in the order of their travel importance. Here I would like to pick out 5 of the major travel activities to do in Kanyakumari and this list is not from my personal experience, rather as a result of a small research made on the internet. So here goes the 5 must to do travel activities in Kanyakumari. Hope you enjoy it. The Vivekananda Rock Memorial is the hallmark of Kanyakumari as this memorial is the first thing that comes into mind, when we talk about Kanyakumari. Apart from being a travel attraction, the Vivekananda Rock Memorial is also a sacred monument and is located 500 meters from the the mainland of Vavathurai. This enchanting rock memorial was built in the year 1970 in honour of Swami Vivekananda and ever since it has grown in popularity and importance. Enjoy a great time at the Vivekananda Rock Memorial in Kanyakumari and enjoy it’s amazing architecture and calm atmosphere that can really make your relaxed and rejuvenated. 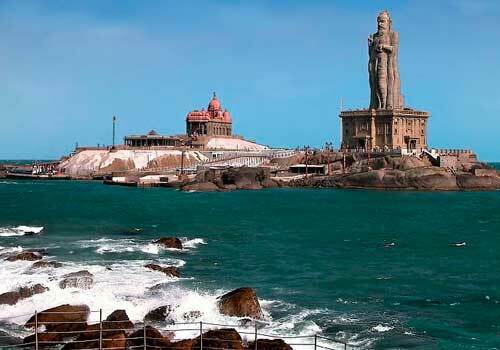 The Gandhi Memorial is another major attraction which is considered as a must to visit travel destination in Kanyakumari. The urn containing ashes remains of Mahatma Gandhi was kept here before being immersed and the memorial is built on that actual spot. Another major unique character of the Gandhi Memorial in Kanyakumari is that on every 2nd October, which is the birthday of Gandhiji, the sun’s rays falls on the exact place where the ashes were kept and this is mainly a classic characteristic of the design and architecture of this Memorial. So explore this Memorial and feel the unique architecture and also get a glimpse of the Indian history. Built as a tribute to K.Kamaraj who was the the Chief Minister of Tamil Nadu and also a great freedom fighter, the Kamaraj Memorial is another major travel attraction in Kanyakumari. The Kamaraj Memorial is home to some of the unique photographs of Kamraj and his meeting with various leaders during the time of his rule. For those interested in history and related activities, the Kamraj Memorial is a perfect place to be. Vivekanandapuram is the headquarters of Vivekananda Kendra and houses an amazing statute of Swami Vivekananda which is worth watching. Vivekanandapuram is an awesome destination to spend your time during your visit to Kanyakumari and the serene and calm atmosphere will prompt you to stay here for a longer period. Affordable accommodation is also available at Vivekandanpuram and hence you can take relax and take your own time while exploring Vivekanandapuram and its nearby attractions. The sunset viewing at Kanyakumari beach is the most perfect thing to experience at Kanyakumari. Kanyakumari is well known for the amazing sunset that can be watched at the beach and travelers gathering at the beach during the evening to watch the sunset are a regular view. The unique geographical characteristics make the beach and sunset more beautiful and this is one of the major reasons why all the travelers are attracted towards sunset viewing activities at Kanyakumari. So have a relaxed time and map the amazing view of the sunset into your mind. This entry was posted in Kanyakumari and tagged kanyakumari travel, things to do in kanyakumari, travel activities in kanyakumari. Bookmark the permalink. absolute beauty post !! detailed !! Kanyakumari has been my travel target since 2 years now !! lets see when would I really get to see the beautiful place and the Vivekanand Rock ! Hi MySay,Hope that you visit the place very soon. All the best!! After reading it I have added Kanyakumari to my list of places to see! You did a right thing and you will never regret adding Kanyakumari to your list of travel places.